Olá! This week I bring a review of a very special "livro"... More than sixty years ago Anchor begun publishing a book series that came to have at least 837 numbers. The numeration is not easy to understand and I believe there were not 837 books!! But I do know that Clark & Co., Ltd. (at the time not yet merged with J. & P. Coats) made the right choice regarding the first number! Now I'm becoming unbearably smug!!! I bought it some weeks ago while I was doing the research for my first post and the moment I received it I decided to write on it. There are more second hand copies, so run if you want to buy one! The book author is Maria Clementina Carneiro de Moura, a renowned painter, that developed important literary and educational activities in textiles, teaching and publishing her works that became significant for the understanding of Portuguese textile handicrafts history and technique. She was also a political activist and always attentive to social problems that Portugal was facing at the time. The ideia of this book was to show how traditional embroidery could be adapted to "modern times". 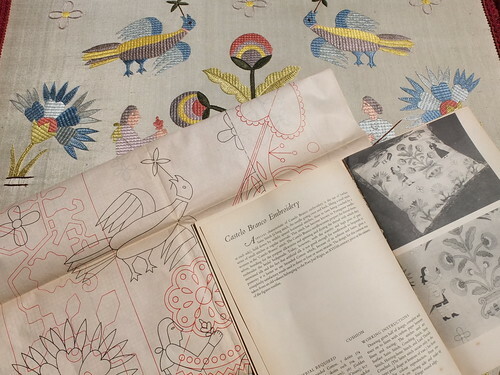 In her words "The country from north to south was scoured to collect material which (... ) could be considered suitable for adaptation to modern needlework, which is cultivated by all Portuguese women to beautify their homes." As far as I understand, valuable specimens were collected in order to inspire the design of new ones. The execution of the new pieces, while many times forced to give a simplified version of the original specimen, respected the style and the stitches of the old ones. As argued by the author: "they must be decorative, practical, simple and easy to execute". The book goes through many traditional regional embroideries and for each one there is: a brief explanation of its main characteristics, sometimes a photo of the original specimen collected, the new piece inspired by the old one and the instructions for its execution - material required and working instructions. All embroidery patterns are printed in the design sheets. Let me show you... Inspired by Viana do Castelo costumes a table cloth was designed and executed as shown in the black and white photo. The list of the material required, the working instructions and the drawings are provided. 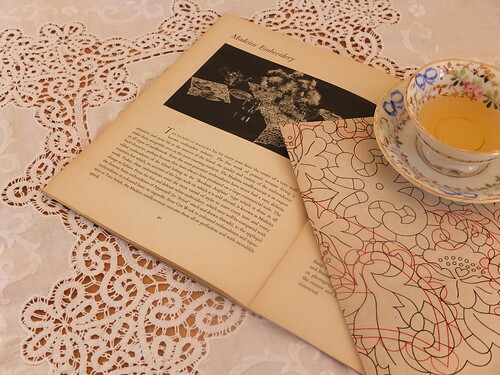 The regional traditional embroideries represented in the book are: Viana do Castelo, Azores, Castelo Branco, Caldas da Raínha, Guimarães, Tibaldinho, Madeira and Nisa. Some important stitches are also illustrated: chain stitch embroidery, cross stitch embroidery, shaded embroidery, net embroidery and "dove's eye" embroidery. In addition to the word "livro" (book), and after such a big post, I have to teach you another Portuguese word that expresses my feeling in case you've reached here... Obrigada - thank you! Lovely and inspiring! I have truly enjoyed learning about Portuguese embroidery. Keep the posts coming! Obrigada! Isn't it a shame that they did not have access to color photography for this book? It is so difficult for me to imagine color on a black and white pattern. Thank you for taking time to explain the book and add your own colorful work, as well. Another enjoyable post Gabi, I really appreciate all the effort you have put into explaining the different Portuguese stitches. I like the idea of the Napkin Bag. 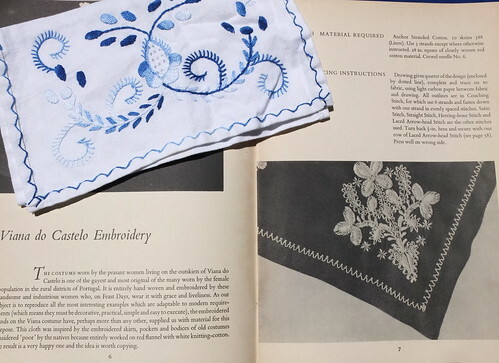 Thank you for such an interesting post, I am really enjoying learning about Portuguese embroidery. My great-grandparents were Portuguese and I've always wanted to visit your beautiful country. I look forward to your posts every Thursday. Obrigada! Hard to decide what I like better, the colorful, cheerful Castelo Branco sample or the understated but beautiful Azores sample. They are so different! But I like them both. This looks like an amazing book. Thank you so much for your wonderful post. Thank you Gabi for this review. I'm portuguese and i feel that it's such a blessing to have been raised in a country full of beauty and tradition. Our embroidery represents a living common place to all the aspects of our identity. Congratulations for your work! Gabi, thank you for the great article review. Tenho andado a procura de kits e desenhos online com "Portuguese Themes" e gostei muito de ver o seu website e etsy store. Obrigado! 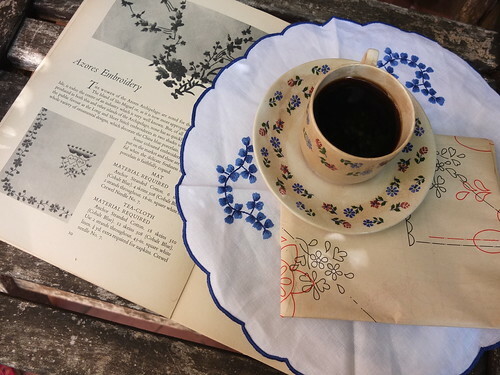 thank you for the color photographs, they are quite stunning, though I admit, I most want to make a pretty white lace tablecloth as one of the pictures illustrates. I'll have to bookmark your blog so I can read all your other posts on embroidery. wonderful. 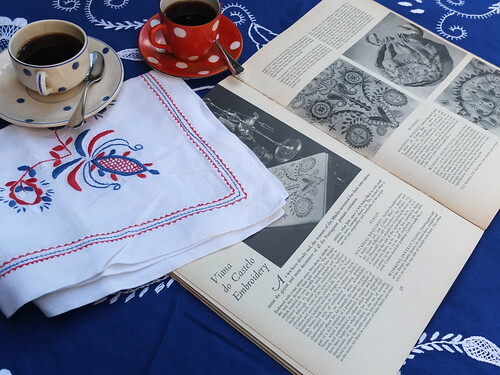 I have a Viana do Castelo table cloth, and some from Azores as well. You explained our country famous stitches beautifully Gabi, I'm really proud that you're blogging here! Oh my gosh how beautiful is this! :-) Love it! Hi, I have a pocket just the same as yours in Viana do Castelo Embroidery photo. It belonged to my husband's grandmother. Beautiful work. Wows its looks great. You did a great job. 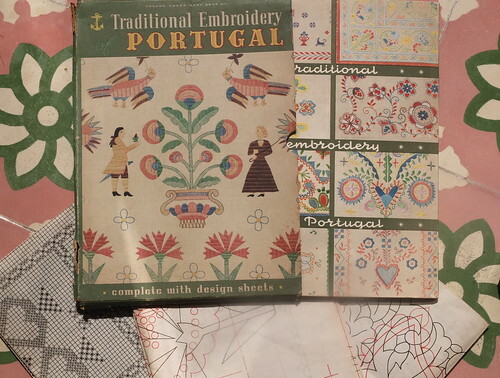 such a great article about traditional embroidery of portugal.its really successful work.